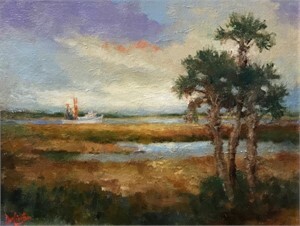 JIM DARLINGTON | HEAT RISING | Caper's and Bull's Island“The Capers Island Series was inspired by visits to both Caper’s and Bull’s Islands. 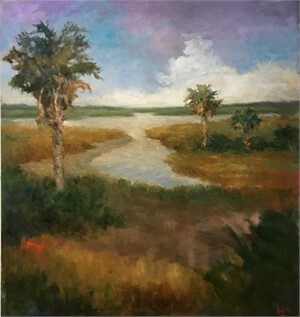 The paintings do not portray specific scenes; rather, I have taken elements from on-site sketches, photographs and memory to produce paintings that evoke my experience on both barrier islands. 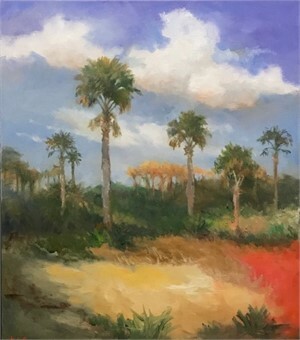 My use of bright reds, yellows and violet expresses the heat and intensity of my visits during the warm Lowcountry summers.” -- Jim Darlington Both Caper’s and Bull’s Islands are treasured as pristine and unspoiled local barrier islands. 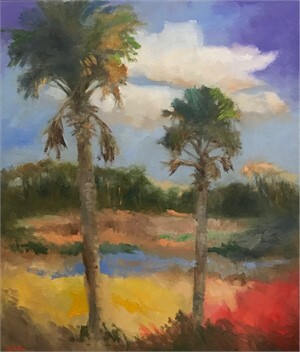 In this series of paintings by Darlington, you can hear the cicadas, the rustling grasses and palm fronds and feel the silky humidity with the heat rising from the earth. 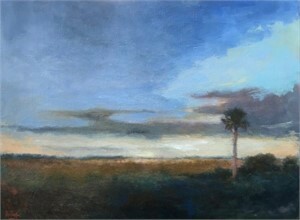 Regardless of the subject, Darlington captures a range of emotions and you are offered a glimpse into his creative process as he pulls together unique compositions from his experiences. 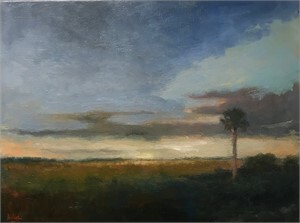 This is done sometimes with subtle, fine brushwork and other times with strong palette knife work to add a dramatic, sculptural visual impact. 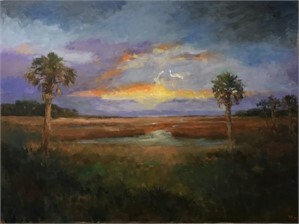 A native South Carolinian who has spent a lifetime immersed in the arts, Darlington has worked as a journalist and an art critic in the past in addition to his long career as a painter. 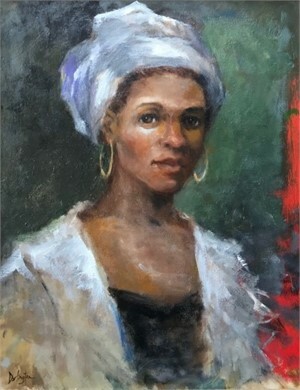 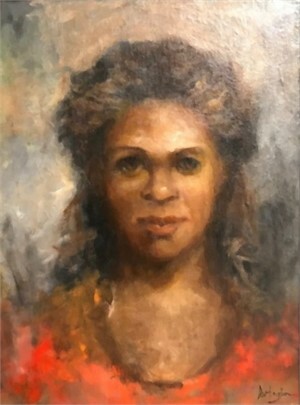 Darlington states, “ I’m looking for a mood that the viewer can respond to... to make a human connection with...” There will also be a few special portraits in this show as they continue to be an important aspect of Darlington’s work. 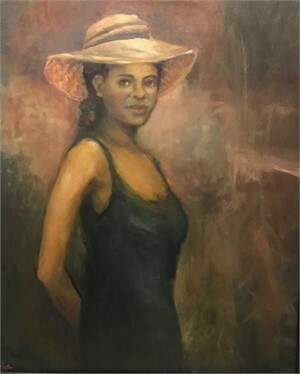 Figurative work is an area that he enjoys immensely; often combining features from several models and life sketches into one portrait. 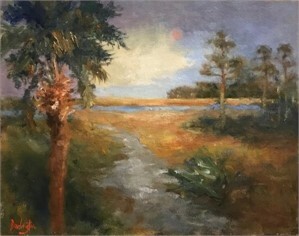 Regardless of the subject, Darlington captures a range of emotions and you are offered a glimpse into his creative process as he pulls together unique compositions from his experiences. 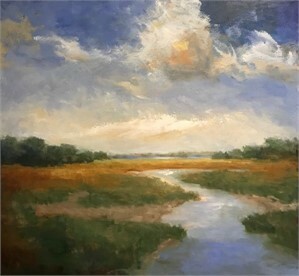 This is done sometimes with subtle, fine brushwork and other times with strong palette knife work to add a dramatic, sculptural visual impact.